I have been trying out so many new, easy recipes lately in an effort to eat healthy. I am in no way a morning person, and find that my schedule doesn't really allow for much day to day prepping. Overnight oats have been a great solution for this. I prep a full weeks worth in Tupperware, and then add milk the night before. You definitely can prep them all the way, but I like each day to be a little bit more fresh. I also don't really like to add any extra sweeteners to my overnight oats. Usually the ingredients are tasty enough, and any sweeteners are just added calories or chemicals. Peanut butter and jelly is one of my all time favorite flavor combinations. If something (really anything) is offered in PBJ flavor, I HAVE to have it. I've tried milkshakes, ice cream sundaes, paninis and crackers. I just can't explain my undying love for PBJ. It was so obvious to me to make PBJ oats. Why not combine my all time favorite flavor with a healthy breakfast food? Well, I've tried it and have one word for everyone-- DELISH. 3. Stir, then enjoy your amazeballs healthy breakfast that you just created. I love the idea of prepping a weeks worth and then adding the milk in the night before. I'm going to have to try this! Pinning! Thanks so much for sharing this at Frugal Crafty Home Blog Hop! Thanks for hosting! 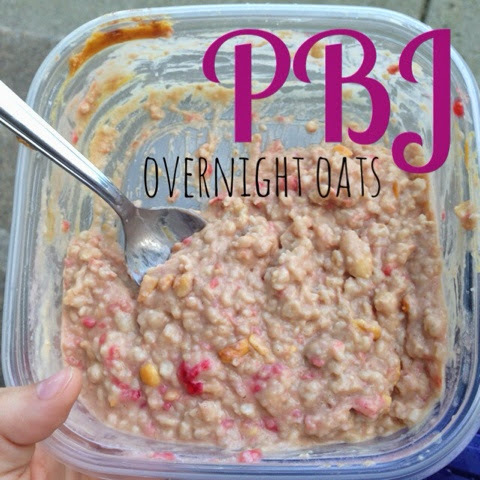 I have a couple other overnight oats recipes to share, you should check those out too!